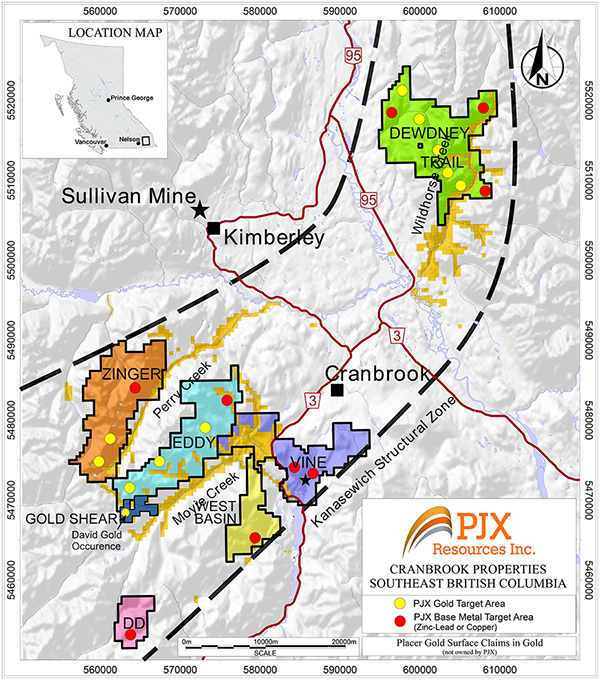 The Gold Shear Property, that hosts the high-grade David Gold Zone, is road accessible and located 29 km southwest of Cranbrook, British Columbia. In January, 2018 PJX announced it had acquired an option to earn 100% interest in the Gold Shear Property that hosts the high grade David gold occurrence. According to B.C. Ministry of Energy Mines and Petroleum Minfile data, gold was first discovered in 1990 when an exposure of gold-mineralized quartz veining within a shear zone was chip sampled across 40 centimetres and assayed up to 144 grams per tonne (g/t) gold. The shear zone occurs within quartzites and siltstones of the Middle Aldridge Formation and has been traced along strike for 1600 metres and 150 metres downdip. The shear is also reported to contain anomalous gold values over this entire length. “Drilling outlined one continuous zone of gold mineralization over a strike length of 150 metres and to a depth of more than 100 metres; thickness averages 2.35 metres. Inferred resources for this zone are 96,000 tonnes grading 13.08 g/t gold (uncut) or 7.11 g/t gold (cut). (Property Development Report by Bapty Research Ltd., 1991).” (quoted from the B.C Ministry of Energy Mines, and Petroleum Resources’ Minfile Record Summary (082FSE108). This gold mineralized zone is called the David Gold Zone. The Gold Shear Property has not been explored since it was last drilled in 1996. Approximately, 70 shallow holes were drilled from 1990 to 1996. The untapped potential of the property is considered to be significant given the strike length of the shear, the shallow depth of historical drilling, the good gold grades and apparent continuity of the David Gold Zone. Rock grab samples, taken by PJX, support the high-grade characteristic of gold mineralization reported by historical drilling and trenching on the David Gold zone. 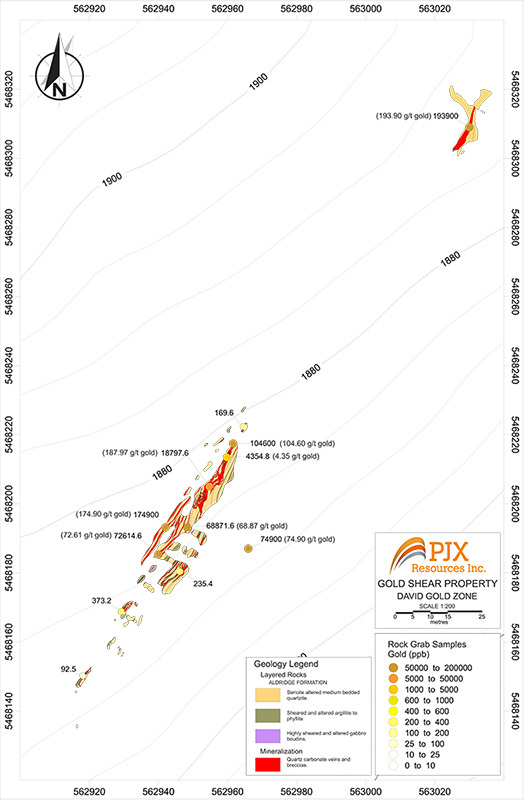 Seven of 12 grab samples taken from the David Gold Zone trench have returned gold grades over 68 g/t with the highest being 193.9 g/t gold (see David Gold Zone map below). 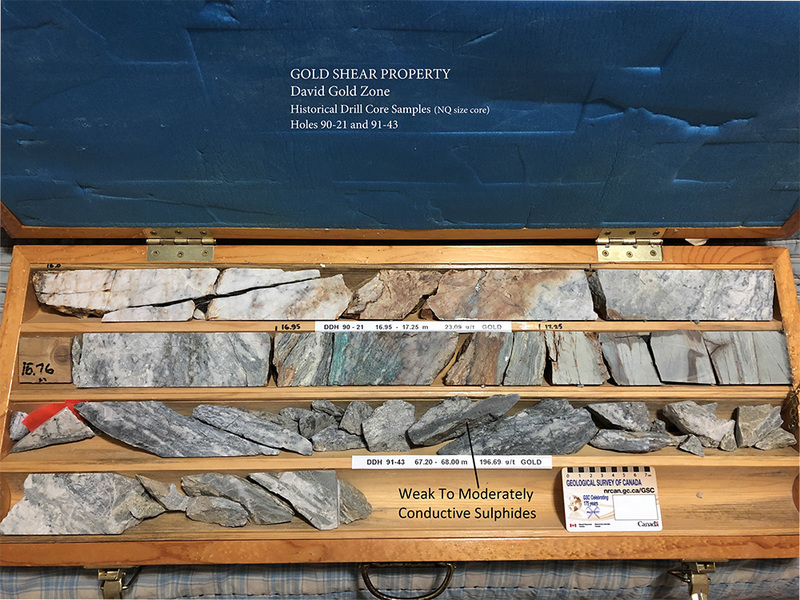 High-grade gold mineralization, intersected by historical drilling on the David Gold Zone, can occur with weak to moderately conductive sulphides (see photo of historical core grading 196.69 g/t gold below). Next steps include the continued collection and compilation of available historical data to identify structural and other controls for gold mineralization. This work will be used to guide additional geophysics, trenching and drilling to expand the gold zone or zones on strike and at depth.